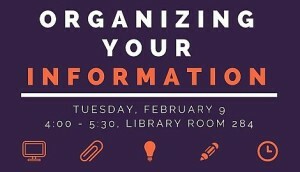 Wednesday, Feb. 3, 4–5:30 p.m.
Tuesday, Feb. 16, 4–5:30 p.m. Learn how to efficiently review and manage information of all types. This covers software such as Twitter, RSS readers, read later programs, note taking and storing applications and citation management software. 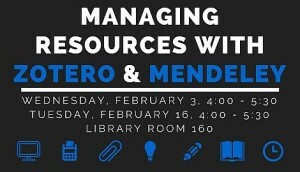 Tuesday, Feb. 9, 4–5:30 p.m.
Want to learn skills that will boost your research and your career? What do you need to consider when you’re working with research data? What file formats and organization should you use? What documentation should accompany your data so that you (and others) can re-use it at a later date (or incorporate it with data collected by others) — possibly years from now? What are the current standards in your field for adding metadata to describe your data and prepare it for deposit in a disciplinary repository or in PDXScholar? 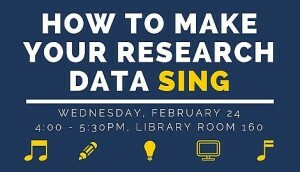 Wednesday, Feb. 24, 4–5:30 p.m.
You can always find our upcoming workshops on the workshop page.